In library and archival science, preservation is a set of activities aimed at prolonging the life of a record while making as few changes as possible. Relevant metadata, enhancement of cultural value, and improvement of access are also important aspects of preservation work. Actions taken to influence record creators prior to selection and acquisition must be avoided for proper preservation. [jargon] Preservation, in this definition, is practiced in a library or an archive by a librarian, archivist, or other professional when they perceive a record is in need of care. Preservation should be distinguished from conservation-restoration of cultural heritage, which refers to the treatment and repair of individual items to slow the process of decay, or restore them to a usable state. Because preservation covers a wide range of efforts aimed at prolonging the life of a record, conservation can be thought of as one of those efforts under the umbrella of preservation. Conservation is occasionally used interchangeably with preservation, particularly outside the professional literature. Collections care is the general maintenance and preventive care of a collection as a whole. This can include activities such as security, environmental monitoring, preservation surveys and more specialized activities such as mass deacidification. Conservation is the treatment and repair of individual items to slow decay or restore them to a usable state. Conservation is occasionally used interchangeably with preservation, particularly outside the professional literature. Digital preservation is the maintenance of digitally stored information. Some means of digital preservation include refreshing, migration, replication and emulation. This should not be confused with digitization, which is a process of creating digital information which must then itself be preserved digitally. Disaster preparedness (RT: Disaster Plan / Business Continuation / Disaster Recovery / Disaster Mitigation Plan) is the practice of arranging for the necessary resources and planning the best course of action to prevent or minimize damage to a collection in the event of a disaster of any level of magnitude, whether natural or man-made. Reformatting is the practice of creating copies of an object in another type of data-storage device. Reformatting processes include microfilming and digitization. Visual material - Color photography § Preservation issues & Architectural reprography, a variety of technologies and media used to make multiple copies of original drawings or records created by architects, engineers, mapmakers and related professionals. It has been suggested that Digitization#Library preservation be merged into this section. (Discuss) Proposed since January 2019. A relatively new concept, digitization, has been hailed as a way to preserve historical items for future use. "Digitizing refers to the process of converting analog materials into digital form." For manuscripts, digitization is achieved through scanning an item and saving it to a digital format. For example, the Google Book Search program has partnered with over forty libraries around the world to digitize books. The goal of this library partnership project is to "make it easier for people to find relevant books – specifically, books they wouldn't find any other way such as those that are out of print – while carefully respecting authors' and publishers' copyrights." Although digitization seems to be a promising area for future preservation, there are also problems. The main problems are that digital space costs money, formats change, and backwards compatibility is not guaranteed. Higher-quality images take a longer time to scan, but are often more valuable for future use. Fragile items are often more difficult or more expensive to scan, which creates a selection problem for preservationists. Other problems include scan quality, redundancy of digitized books among different libraries, and copyright law. However, many of these problems are being solved through educational initiatives. Educational programs are tailoring themselves to fit preservation needs and help new students understand preservation practices. Programs teaching graduate students about digital librarianship are especially important. Groups such as the Digital Preservation Network strive to ensure that "the complete scholarly record is preserved for future generations". The Library of Congress maintains a Sustainability of Digital Formats web site that educates institutions on various aspects of preservation: most notably, on approximately 200 digital format types and which are most likely to last into the future. Digital Preservation is another name for digitization, and is the term more commonly used in archival courses. The main goal of digital preservation is to guarantee that people will have access to the digitally preserved materials long into the future. When practicing preservation one has several factors to consider to properly preserve a record: 1) the environment the record is store in, 2) the criteria to determine when preservation is necessary, 3) what standard practices will be laid down for preservation in an individual institution, 4) research and testing, and 5) vendor services needed for preservation. Environmental controls are necessary to facilitate the preservation of organic materials and are especially important to monitor in rare and special collections. Key environmental factors to watch include temperature, relative humidity, pests, pollutants, and light exposure. In general, the lower the temperature is, the better it is for the collection. However, since books and other materials are often housed in areas with people, a compromise must be struck to accommodate human comfort. A reasonable temperature to accomplish both goals is 65-68˚F however, if possible, film and photography collections should be kept in a segregated area at 55˚F. Books and other materials take up and give off moisture making them sensitive to relative humidity. Very high humidity encourages mold growth and insect infestations. Low humidity causes materials to lose their flexibility. Fluctuations in relative humidity are more damaging than a constant humidity in the middle or low range. Generally, the relative humidity should be between 30-50% with as little variation as possible, however recommendations on specific levels to maintain vary depending on the type of material, i.e. paper-based, film, etc. A specialized dew point calculator for book preservation is available. Pests, such as insects and vermin, eat and destroy paper and the adhesive that secures book bindings. Food and drink in libraries, archives, and museums can increase the attraction of pests. An Integrated Pest Management system is one way to control pests in libraries. Particulate and gaseous pollutants, such as soot, ozone, sulfur dioxide, oxides of nitrogen, can cause dust, soiling, and irreversible molecular damage to materials. Pollutants are exceedingly small and not easily detectable or removable. A special filtration system in the building's HVAC is a helpful defense. Exposure to light also has a significant effect on materials. It is not only the light visible to humans that can cause damage, but also ultraviolet light and infrared radiation. Measured in lux or the amount of lumens/m2, the generally accepted level of illumination with sensitive materials is limited to 50 lux per day. Materials receiving more lux than recommended can be placed in dark storage periodically to prolong the original appearance of the object. Recent concerns about the impact of climate change on the management of cultural heritage objects as well as the historic environment has prompted research efforts to investigate alternative climate control methods and strategies that include the implementation of alternative climate control systems to replace or supplement traditional high-energy consuming HVAC systems as well as the introduction of passive preservation techniques. Rather than maintaining a flat line, consistent 24/7 condition for a collection's environment, fluctuation can occur within acceptable limits to create a preservation environment while also thinking of energy efficiency and taking advantage of the outside environment. Bound materials are sensitive to rapid temperature or humidity cycling due to differential expansion of the binding and pages, which may cause the binding to crack and/or the pages to warp. Changes in temperature and humidity should be done slowly so as to minimize the difference in expansion rates. However, an accelerated aging study on the effects of fluctuating temperature and humidity on paper color and strength showed no evidence that cycling of one temperature to another or one RH to another caused a different mechanism of decay. Contamination can occur at the time of manufacture, especially with electronic materials. It must be stopped before it spreads, but it is usually irreversible. Making a proper decision is an important factor before starting preservation practices. Decision making for preservation should be made considering significance and value of materials. Significance is considered to have two major components: importance and quality. "Importance" relates to the collection's role as a record, and "quality" covers comprehensiveness, depth, uniqueness, authenticity and reputation of the collection. Moreover, analyzing the significance of materials can be used to uncover more about their meaning. Assessment of significance can also aid in documenting the provenance and context to argue the case for grant funding for the object and collection. the cost against the benefits from its existence. Worn books at the library of Merton College, Oxford. comparative value (rarity, completeness, integrity relative to others of its kind). Since the 1970s, the Northeast Document Conservation Center has stated that the study of understanding the needs of the archive/library is inherently important to the survival of archives and libraries. In order for the preservation of a collection to survive for a long time it is important that a systematic preservation plan is in place. The first step in planning a preservation program is to assess the institution's existing preservation needs. This process entails identifying the general and specific needs of the collection, establishing priorities, and gathering the resources to execute the plan. Because budget and time limitations require priorities to be set, standards have been established by the profession to determine what should be preserved in a collection. Considerations include existing condition, rarity, and evidentiary and market values. With non-paper formats, the availability of equipment to access the information will be a factor (for example, playback equipment for audio-visual materials, or microform readers). An institution should determine how many, if any, other repositories hold the material, and consider coordinating efforts with those that do. Institutions should establish an environment conducive to preservation changes, involve staff, and create an understanding among administration and staff. The first steps an institution should implement, according to the NEDCC, are to establish a policy that defines and charts the course of action and create a framework for carrying out goals and priorities. There are three methods for carrying out a preservation survey: general preservation assessment, collection condition surveys, and an item-by-item survey. General condition surveys can be part of a library inventory. Selection for treatment determines the survival of materials and should be done by a specialist, whether in relation to an established collection development policy or on an item by item basis. Once an object or collection has been chosen for preservation, the treatment must be determined that is most appropriate to the material and its repository. If the information is most important, reformatting or creation of a surrogate is a likely option. If the artifact itself is of value, it will receive conservation treatment, ideally of a reversible nature. With old media deteriorating or showing their vulnerabilities and new media becoming available, research remains active in the field of conservation and preservation. Everything from how to preserve paper media to creating and maintaining electronic resources and gauging their digital permanence is being explored by students and professionals in archives/libraries. The two main issues that most institutions tend to face are the rapid disintegration of acidic paper and water damage (due to flooding, plumbing problems, etc.). Therefore, these areas of preservation, as well as new digital technologies, receive much of the research attention. The American Library Association has many scholarly journals that publish articles on preservation topics, such as College and Research Libraries, Information Technology and Libraries, and Library Resources and Technical Services. Scholarly periodicals in this field from other publishers include International Preservation News, Journal of the American Institute for Conservation, and Collection Management among many others. Many private entities provide preservation and conservation services and supplies. One of the most well known companies in preservation is Hollinger Metal Edge. They sell Hollinger boxes, folders, AV preservation tools, archival paper, exhibit material, and even furniture. Gaylord Archival is another trusted company when it comes to archival supplies, as is University Products. Learning the proper methods of preservation is important and most archivists are educated on the subject at academic institutions that specifically cover archives and preservation. In the United States most repositories require archivists to have a degree from an ALA-accredited library school. Similar institutions exist in countries outside the US. Since 2010, the Andrew W. Mellon Foundation has enhanced funding for library and archives conservation education in three major conservation programs. These programs are all part of the Association of North American Graduate Programs in the Conservation of Cultural Property (ANAGPIC). Another educational resource available to preservationists is the Northeast Document Conservation Center or NEDCC. The Preservation, Planning and Publications Committee of the Preservation and Reformatting Section (PARS) in the Association for Library Collections & Technical Services has created a Preservation Education Directory of ALA Accredited schools in the U.S. and Canada offering courses in preservation. The directory is updated approximately every three years. The 10th Edition was made available on the ALCTS web site in March 2015. Campbell Center for Historic Preservation Studies, Mount Carroll, IL. Limited, tax-driven funding can often interfere with the ability for public libraries to engage in extensive preservation activities. Materials, particularly books, are often much easier to replace than to repair when damaged or worn. Public libraries usually try to tailor their services to meet the needs and desires of their local communities, which could cause an emphasis on acquiring new materials over preserving old ones. Librarians working in public facilities frequently have to make complicated decisions about how to best serve their patrons. Commonly, public library systems work with each other and sometimes with more academic libraries through interlibrary loan programs. By sharing resources, they are able to expand upon what might be available to their own patrons and share the burdens of preservation across a greater array of systems. Archival facilities focus specifically on rare and fragile materials. With staff trained in appropriate techniques, archives are often available to many public and private library facilities as an alternative to destroying older materials. Items that are unique, such as photographs, or items that are out of print, can be preserved in archival facilities more easily than in many library settings. Because so many museum holdings are unique, including print materials, art, and other objects, preservationists are often most active in this setting; however, since most holdings are usually much more fragile, or possibly corrupted, conservation may be more necessary than preservation. This is especially common in art museums. Museums typically hold to the same practices lead by archival institutions. To the ancient Egyptians, the scarab or dung beetle (see: Scarab (artifact)) was a protector of written products. In ancient Babylon, Nabu is the heavenly patron of books and protector of clay tablets. Nabu is the Babylonian god of wisdom and writing, and is the patron of the scribes, librarians and archivists. In Arabic and other eastern societies, sometimes a traditional method to protect books and scrolls was a metaphysical appeal to "Kabi:Kaj", the "King of the Cockroaches". There are three saints in the Christian church that are closely associated with libraries as patrons: Saint Lawrence, Saint Jerome, and Saint Catharine of Alexandria or Catherine of Alexandria. 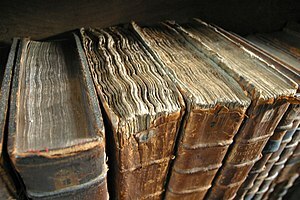 In some Christian monasteries, prayers and curses were placed at the end of books to prevent theft, or to damn the thieves. Frequently called a "book curse", these were placed in the book to deter theft. The ancient Chinese god Wei T'O is the patron god of libraries and books. Many examples of appeals to Wei T'O can be found in Chinese manuscripts dated five hundred or more years ago. Wei T'O is especially invoked for the protection of books and libraries against fire. Since the modern books are suffering from acid decomposition (slow fires), Wei T'O is especially relevant to modern librarianship. A modern product to de-acidify paper is named in his honor. Sri Lankan symbols or images of the Sinhalese "Fire Demons" are hung in the corners of libraries and other buildings to appease the incendiary demons and to avert fire, lightning and cataclysm, according to Sinhalese mythology. Since fire and acid decomposition (also known as "slow fires") are a special problem for libraries because of the concentration of paper products, the "Fire Demons" are also included when used to assuage these destroyers of libraries and books. The Aztec and Mayan Indians of Latin America also had deities concerned with libraries. The major god, Quetzalcoatl, is credited with the discoveries of the arts, the calendar, and of writing. A single feather or plume at the beginning or at the end of a document or stone carving would indicate a dedication to the "Feathered Serpent." This symbol degenerated over time to a single fringed line. Human record-keeping arguably dates back to the cave painting boom of the upper paleolithic, some 32,000-40,000 years ago. More direct antecedents are the writing systems that developed in the 4th millennium B.C. Written record keeping and information sharing practices, along with oral tradition, sustain and transmit information from one group to another. This level of preservation has been supplemented over the last century with the professional practice of preservation and conservation in the cultural heritage community. Oral tradition or oral culture, the transmission of information from one generation to the next without a writing system. Antiquarian practices, including scribal practice, burial practice, the libraries at Pergamum, Alexandria and other ancient archives. 1933: William Barrow introduces the field of conservation to paper deacidification when he publishes a paper on the acid paper problem. In later studies, Barrow tested paper from American books made between 1900 and 1949, and learned that after forty years the books had lost on average 96 percent of their original strength; after less than ten years, they had already lost 64 percent. Barrow determined that this rapid deterioration was not the direct result of using wood-pulp fibers, since rag papers of this period were also aging rapidly, but rather due to the residual sulfuric acid produced in both rag and wood pulp papers. Manufacturing methods used after 1870 employed sulfuric acid for sizing and bleaching the paper. Earlier papermaking methods left the final product only mildly alkaline or even neutral. Such paper has maintained its strength for 300 to 800 years, despite sulfur dioxide and other air pollutants. Barrow's 1933 article on the fragile state of wood pulp paper predicted the life expectancy, or "LE", of this paper was approximately 40–50 years. At that point the paper would begin to show signs of natural decay, and he concluded that research for a new media on which to write and print was needed. 1966: The Flood of the River Arno in Florence, Italy damaged or destroyed millions of rare books and led to the development of restoration laboratories and new methods in conservation. Instrumental in this process was conservationist Peter Waters, who led a group of volunteers, called "mud angels", in restoring thousands of books and papers. This event awakened many historians, librarians, and other professionals to the importance of having a preservation plan. Many consider this flood to be one of the worst disasters since the burning of the Library of Alexandria. It spurred a resurgence in the profession of preservation and conservation worldwide. 1989: March 7 ["Commitment Day"] Major US print publishers convene at NYPL to endorse a community-wide commitment to utilizing ISO 9706 certified permanent durable paper in order to combat the acid paper epidemic. William Barrow (1904–1967) was an American chemist and paper conservator, and a pioneer of library and archives conservation. He introduced the field of conservation to paper deacidification through alkalization. Paul N. Banks (1934–2000) was Conservator and Head of the Conservation Department at the Newberry Library from 1964 to 1981, and published regularly on bookbinding, book and paper conservation, and problems related to conservation. He designed and implemented a curriculum for Columbia University's School of Library Science that dealt directly with preservation training. Pamela Darling, author and historian, was Preservation Specialist for the Association of Research Libraries. Her works include materials to aid libraries in establishing their own comprehensive preservation programs. Carolyn Harris worked as head of Columbia University Libraries' Preservation Division from 1981 until 1987, where she worked closely with Paul Banks. She published extensive research throughout her career, especially dealing with mass deacidification of wood-pulp paper. Peter Waters, former Conservation Officer at the Library of Congress in Washington, DC, worked in the areas of disaster recovery and preparedness, and the salvaging of water-damaged paper goods. Nicholson Baker is a contemporary American novelist and author of Double Fold, a criticism of libraries' destruction of paper-based media. Patricia Battin, as the first president of the Commission on Preservation and Access, worked to organize a national campaign both for the use of alkaline paper in publishing companies and for a national program of preservation microfilming. John F. Dean, Preservation and Conservation Librarian at Cornell University, has made contributions towards improving preservation efforts in developing countries. Specifically, Dean has created online tutorials for library conservation and preservation in Southeast Asia and Iraq and the Middle East. The Paul Banks and Carolyn Harris Preservation Award for outstanding preservation specialists in library and archival science, is given annually by the Association for Library Collections & Technical Services, a subdivision of the American Library Association. It is awarded in recognition of professional preservation specialists who have made significant contributions to the field. Reformatting, or in any other way copying an item's contents, raises obvious copyright issues. In many cases, a library is allowed to make a limited number of copies of an item for preservation purposes. In the United States, certain exceptions have been made for libraries and archives. Ethics will play an important role in many aspects of the conservator's activities. When choosing which objects are in need of treatment, the conservator should do what is best for the object in question and not yield to pressure or opinion from outside sources. Conservators should refer to the AIC Code of Ethics and Guidelines for Practice, which states that the conservation professional must "strive to attain the highest possible standards in all aspects of conservation." One instance in which these decisions may get tricky is when the conservator is dealing with cultural objects. The AIC Code of Ethics and Guidelines for Practice has addressed such concerns, stating "All actions of the conservation professional must be governed by an informed respect for cultural property, its unique character and significance and the people or person who created it." This can be applied in both the care and long-term storage of objects in archives and institutions. It is important that preservation specialists to be respectful of cultural property and the societies that created it, it is also important for them to be aware of international and national laws pertaining to stolen items. In recent years there has been a rise in nations seeking out artifacts that have been stolen and are now in museums. In many cases museums are working with the nations to find a compromise to balance the need for reliable supervision as well as access for both the public and researchers. Conservators are not just bound by ethics to treat cultural and religious objects with respect, but also in some cases by law. For example, in the United States, conservators must comply with the Native American Graves Protection and Repatriation Act (NAGPRA). The First Archivists Circle, a group of Native American archivists, has also created Protocols for Native American Archival Materials. The non-binding guidelines are suggestions for libraries and archives with Native American archival materials. The care of cultural and sacred objects often affects the physical storage or the object. For example, sacred objects of the native peoples of the Western United States are supposed to be stored with sage to ensure their spiritual well being. The idea of storing an object with plant material is inherently problematic to an archival collection because of the possibility of insect infestation. When conservators have faced this problem, they have addressed it by using freeze-dried sage, thereby meeting both conservation and cultural needs. Some individuals in the archival community have explored the possible moral responsibility to preserve all cultural phenomena, in regards to the concept of monumental preservation. Other advocates argue that such an undertaking is something that the indigenous or native communities that produce such cultural objects are better suited to perform. Currently, however, many indigenous communities are not financially able to support their own archives and museums. Still, indigenous archives are on the rise in the United States. There is a longstanding tension between preservation of and access to library materials, particularly in the area of special collections. Handling materials promotes their progression to an unusable state, especially if they are handled carelessly. On the other hand, materials must be used in order to gain any benefit from them. In a collection with valuable materials, this conflict is often resolved by a number of measures which can include heightened security, requiring the use of gloves for photographs, restricting the materials researchers may bring with them into a reading room, and restricting use of materials to patrons who are not able to satisfy their research needs with less valuable copies of an item. These restrictions are annoyances to researchers who feel that these measures are in place solely to keep materials out of the hands of the public. There is also controversy surrounding preservation methods. A major controversy at the end of the twentieth century centered on the practice of discarding items that had been microfilmed. This was the subject of novelist Nicholson Baker's book Double Fold, which chronicled his efforts to save many old runs of American newspapers (formerly owned by the British Library) from being sold to dealers or pulped. A similar concern persists over the retention of original documents reformatted by any means, analog or digital. Concerns include scholarly needs and legal requirements for authentic or original records as well as questions about the longevity, quality and completeness of reformatted materials. Retention of originals as a source or fail-safe copy is now a fairly common practice. Another controversy revolving around different preservation methods is that of digitization of original material to maintain the intellectual content of the material while ignoring the physical nature of the book. Further, the Modern Language Association's Committee on the Future of the Print Record structured its "Statement on the Significance of Primary Records" on the inherent theoretical ideology that there is a need to preserve as many copies of a printed edition as is possible as texts and their textual settings are, quite simply, not separable, just as the artifactual characteristics of texts are as relevant and varied as the texts themselves (in the report mentioned herewith, G. Thomas Tanselle suggests that presently existing book stacks need not be abandoned with emerging technologies; rather they serve as vitally important original (primary) sources for future study). Many digitized items, such as back issues of periodicals, are provided by publishers and databases on a subscription basis. If these companies were to cease providing access to their digital information, facilities that elected to discard paper copies of these periodicals could face significant difficulties in providing access to these items. Discussion as to the best ways to utilize digital technologies is therefore ongoing, and the practice continues to evolve. Of course, the issues surrounding digital objects and their care in libraries and archives continues to expand as more and more of contemporary culture is created, stored, and used digitally. These born-digital materials raise their own new kinds of preservation challenges and in some cases they may even require use new kinds of tools and techniques. In her book "Sacred Stacks: The Higher Purpose of Libraries and Librarianship", Nancy Kalikow Maxwell discusses how libraries are capable of performing some of the same functions as religion. Many librarians feel that their work is done for some higher purpose. The same can be said for preservation librarians. One instance of the library's role as sacred is to provide a sense of immortality: with the ever-changing world outside, the library will remain stable and dependable. Preservation is a great help in this regard. Through digitization and reformatting, preservation librarians are able to retain material while at the same time adapting to new methods. In this way, libraries can adapt to the changes in user needs without changing the quality of the material itself. Through preservation efforts, patrons can rest assured that although materials are constantly deteriorating over time, the library itself will remain a stable, reliable environment for their information needs. Another sacred ability of the library is to provide information and a connection to the past. By working to slow down the processes of deterioration and decay of library materials, preservation practices help keep this link to the past alive. ^ "A Glossary of Archival and Records Terminology". www.archivists.org. Society of American Archivists. Retrieved 2007-05-11. ^ "General Preservation - FAQ - About (Preservation, Library of Congress)". www.loc.gov. Retrieved 2019-04-24. ^ "Preservation of Cultural Artifacts". wiki.spsu.edu. Southern Polytechnic State University. Archived from the original on 2007-06-11. Retrieved 2007-05-11. ^ Oya Y. Rieger, Preservation in the Age of Large-Scale Digitization: A White Paper, (Washington, D.C.: Council on Library and Information Resources, 2008): 10, http://www.clir.org/pubs/reports/reports/pub141/pub141.pdf Archived 2015-09-19 at the Wayback Machine. ^ Google Books Library Project. ^ Conway, Paul (2010). "Preservation in the Age of Google: Digitization, Digital Preservation, and Dilemmas". Library Quarterly. 80 (1): 73. ^ "Library of Congress: Sustainability of Digital Formats". ^ admin (2008-02-21). "Definitions of Digital Preservation". Association for Library Collections & Technical Services (ALCTS). Retrieved 2018-04-23. ^ Lull, W.P. (1990). Conservation environment guidelines for libraries and archives; with the assistance of Paul N. Banks. Albany, NY: The University of the State of New York, The State Education Dept., The New York State Library, Division of Library Development. ^ "Temperature, Relative Humidity, Light, and Air Quality: Basic Guidelines for Preservation". Northeast Document Conservation Center. Archived from the original on 2007-12-12. Retrieved 2007-12-09. ^ "UCSD Libraries Preservation Department. "Why is Eating and Drinking in the Library Discouraged?" 2006. UCSD. 18 June 2008". Archived from the original on 2006-08-30. Retrieved 2008-07-18. ^ "Climate change and the historic environment". Centre for Sustainable Heritage, University College London. Archived from the original on 2008-05-04. Retrieved 2008-04-27. ^ "From the Outside in: Preventive conservation, sustainability, and environmental conservation". Getty Conservation Institute. Retrieved 2008-04-25. ^ "Collections care, human comfort, and climate control: A case study at the Casa de Rui Barbosa Museum". Getty Conservation Institute. Retrieved 2008-04-25. ^ "Preservation, Conservation, Restoration: What's the Difference? | Computer History Museum". www.computerhistory.org. Retrieved 2018-04-23. ^ "Banana Book". Flickr. Retrieved 2018-05-07. ^ "A Significance Recognition Scheme for Non-National Museums and Galleries in Scotland" (PDF). Scottish Museums Council. Archived from the original (PDF) on 2007-11-06. Retrieved 2007-10-08. ^ a b Dorner, Daniel; Young, Sophie (2007). "A Regional Approach to Identifying Items of National Significance Held by Small Cultural Institutions in New Zealand". Archived from the original on 2007-03-28. Retrieved 2017-07-03. ^ "Significance - A Guide to Assessing the Significance of Cultural Heritage Objects and Collections". Heritage Collections Council (Australia). Retrieved 2007-10-08. ^ Pymm, Bob (2006). "Building Collections for All Time: the Issue of Significance". AARL (Australian Academic Research Libraries). 37 (1): 61–73. doi:10.1080/00048623.2006.10755323. ^ a b Nichols, Stephen G.; Smith, Abby (2001). The Evidence in Hand: Report of the Task Force on the Artifact in Library Collections. Washington, D.C.: Council on Library and Information Resources. ISBN 1-887334-88-2. OCLC 48623491. ^ Matthews, Graham (1995). "Surveying Collections: The importance of Condition Assessment for Preservation Management". Washington, D.C.: Journal of Librarianship and Information Science 27, no. 4. ^ Harris, Carolyn (2000). "Selection for Preservation". In Banks, Paul N.; Pilette, Roberta (eds.). Preservation: Issues and Planning. Chicago: American Library Association. pp. 206–224. ISBN 978-0-585-37626-4. OCLC 48139650. ^ "Hollinger Metal Edge - Since 1945!". www.hollingermetaledge.com. Retrieved 2018-04-23. ^ "Gaylord Archival | Archival Supplies, Exhibit & Display Cases". www.gaylord.com. Retrieved 2019-04-24. ^ "University Products - Thinking in and out of the box since 1968". www.universityproducts.com. Retrieved 2018-04-23. ^ "Best Archives and Preservation Programs". US News & World Report. 2017. ^ "Association of North American Graduate Programs in the Conservation of Cultural Property". University of Texas School of Information. Retrieved 2007-05-11. ^ "NEDCC". Northeast Document Conservation Center. Retrieved 2007-05-11. ^ "Preservation Education Directory 10th Edition". ALCTS. Retrieved 2015-03-26. ^ "American Institute for Conservation of Historic and Artistic Works". American Institute for Conservation of Historic and Artistic Works. Archived from the original on 2015-05-08. Retrieved 2007-05-11. ^ "Amigos Library Services Preservation Service". Amigos Library Services Preservation Service. Archived from the original on 2007-04-04. Retrieved 2007-05-11. ^ "Association for Recorded Sound Collections". Association for Recorded Sound Collections. Retrieved 2007-05-11. ^ "Association of Moving Image Archivists". Association of Moving Image Archivists. Retrieved 2013-05-22. ^ "Buffalo State Art Conservation Department". Buffalo State University. Archived from the original on 2007-04-27. Retrieved 2007-05-11. ^ "Campbell Center for Historic Preservation Studies". Campbell Center for Historic Preservation Studies. Retrieved 2007-05-11. ^ "George Eastman House". George Eastman House. Archived from the original on 2007-05-09. Retrieved 2007-05-11. ^ "International Federation of Film Archives". www.fiafnet.org. Retrieved 2018-04-23. ^ "The Kilgarlin Center for Preservation of the Cultural Record". The Kilgarlin Center for Preservation of the Cultural Record. Retrieved 2007-05-11. ^ "Institute of Fine Arts". www.nyu.edu. New York University. Retrieved 2007-05-11. ^ "North Bennet Street School". North Bennet Street School. Archived from the original on 2007-05-10. Retrieved 2007-05-11. ^ "Art Conservation Program". www.queensu.ca. Queen's University. Archived from the original on 2007-03-31. Retrieved 2007-05-11. ^ "Winterthur Art Conservation Program". www.udel.edu. University of Delaware. Retrieved 2007-05-11. ^ "Preservation Programs at the National Archives". www.archives.gov. The National Archives and Records Administration of the United States of America. Archived from the original on 2007-06-09. Retrieved 2007-05-11. ^ "The Archival Paradigm—The Genesis and Rationales of Archival Principles and Practices". www.clir.org. Council on Library and Information Resources. Retrieved 2007-04-03. ^ Ritzenthaler, Mary Lynn (1993). Preserving Archives and Manuscripts. Chicago: Society of American Archivists. ^ Gacek, Adam. "The Use of Kabikaj in Arabic Manuscripts." Manuscripts of the Middle East. Volume I, 1986. Page 49. ^ Kaschins, Elizabeth and Jane Kemp. "Saint Jerome, the Patron Saint of Librarians." Library Journal. September 1, 1988, pages 135-136. ^ Stevens, Rolland E. (October 1968). "The Library". The Journal of Higher Education. 39 (7): 407–409. doi:10.2307/1980093. JSTOR 1980093. ^ "U.S. Code: Title 17,108. Limitations on exclusive rights: Reproduction by libraries and archives". www.law.cornell.edu]. Legal Information Institute. Retrieved 2008-07-25. ^ a b "AIC Code of Ethics and Guidelines for Practice". Archived from the original on March 4, 2000. ^ "Rightful Owners." Nature, Vol. 440 (6) 2006. ^ Cloonan, Michele V. "The Moral Imperative to Preserve", "Library Trends", Winter 2007. Retrieved on 2008-04-25. ^ Cooper, Amy (2002). "Issues in Native American Archives". Collection Management. 27 (2): 43–54. doi:10.1300/j105v27n02_05. ^ See Robert B. Townsend, "Google Books: What's Not to Like?". www.historians.org. American Historical Association. Retrieved 2008-07-27. ^ See also Paul Duguid, "Inheritance and loss? A brief survey of Google Books". First Monday. Retrieved 2008-07-27. ^ "Statement on the Significance of Primary Records". www.mla.org. Modern Language Association. Archived from the original on 2008-07-01. Retrieved 2008-07-27. ^ Ross, Seamus; Gow, Ann (1999). Digital archaeology? Rescuing Neglected or Damaged Data Resources (PDF). Bristol & London: British Library and Joint Information Systems Committee. ISBN 1-900508-51-6. ^ a b c d Maxwell, Nancy Kalikow (2006). Sacred Stacks: The Higher Purpose of Libraries and Librarianship. Chicago: American Library Association. ISBN 0-8389-0917-5. This page was last edited on 24 April 2019, at 15:40 (UTC).